NSSO data shows average Kashmiri household spends more on recreational goods and rural Kashmir fares much better than rural areas of rest of India. As part of its Kashmir Tracker, the Observer Research Foundation analyses the National Sample Survey Office (NSSO) data to understand the spending patterns of the households of the Kashmir valley under various data points. The data was taken from the Household Consumer Expenditure Surveys conducted by the NSSO. It is a primary source data with indicators on patterns of consumption and well-being of households at the State and National level. These indicators are used by key government institutions in planning and policy formulation. 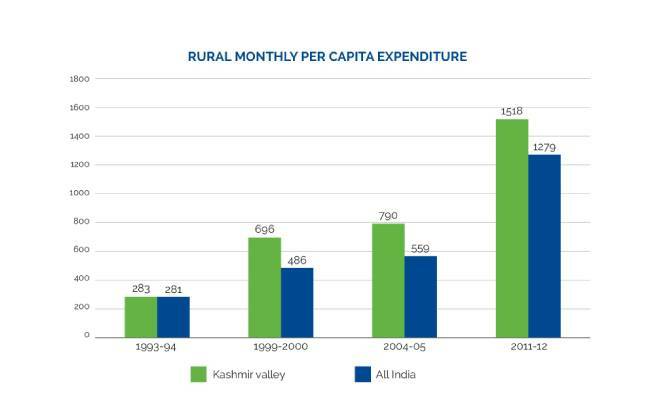 The data from major five-yearly rounds (1993-94; 1999-2000; 2004-05; 2011-12) of Household Consumer Expenditure Surveys was analysed to map out the average per capita spending patterns of rural and urban areas of Jhelum valley (also known as Kashmir valley), compared with the national data. Kashmir valley has witnessed a brutal violent conflict for more than three decades now. The study chose the data from the years of intense conflict, beginning from the 1990s, to the most recent round of the survey to understand the economic well being of Kashmiris. Despite the conflict, the data shows that the consumer expenditure in the valley witnessed increase in tandem with, and in some cases surpassed the national average patterns. Over the last three decades, the overall household expenditure of an average Kashmiri household was over and above the average household in the country. There is also a stark difference in the expenditure patterns of rural and urban spending. This study contradicts the popular myth that conflict has led to impoverishment of an ordinary Kashmiri. In fact, the people of the valley have prospered and are economically well off than people of most of the states in the country, despite the conflict. The following charts are a part of a series of charts that ORF will publish subsequently. This chart shows the average monthly expenditure of Kashmir valley in comparison to an average household in the rest of the country. The data debunks the popular notion that the conflict in the Kashmir valley has adversely affected the general economic well-being of the population. In the 2011-12 round of the survey, the data shows that from 2005-2011 (a relatively peaceful period) the spending gap of an average household in Kashmir in comparison to national average has decreased. 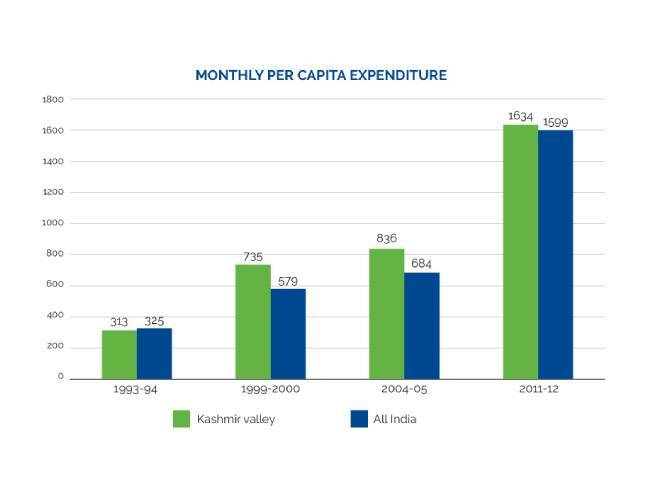 The per capita spending at all-India level and in the valley shows signs of convergence. 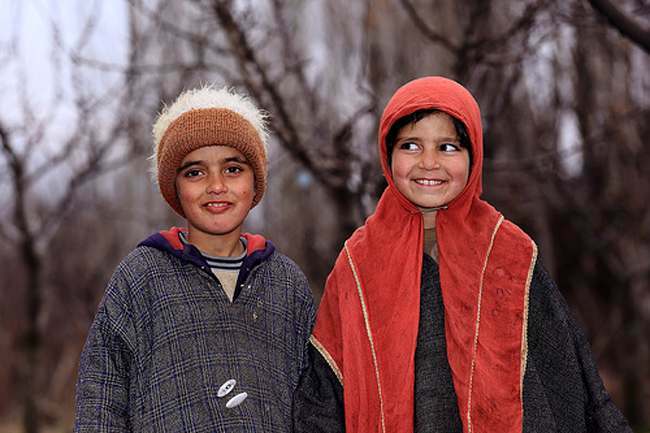 In 1993-94, average monthly expenditure of a Kashmiri household was slightly less than the national average. Since then, Kashmiri household spend more than the all-India average – contrary to the popular perception. The survey data from the urban areas depict a constant increase in the consumer expenditure of the Kashmir valley. The 2011-12 round of the survey shows that the average spending of an urban household in the Kashmir valley marginally goes below the national average. In the first three round depicted in the above graphic, the spending patterns of the urban households were similar to the national average but the data from the 2011-12 round shows that urban India is leaping forward at a greater pace than the urban areas of Kashmir valley. 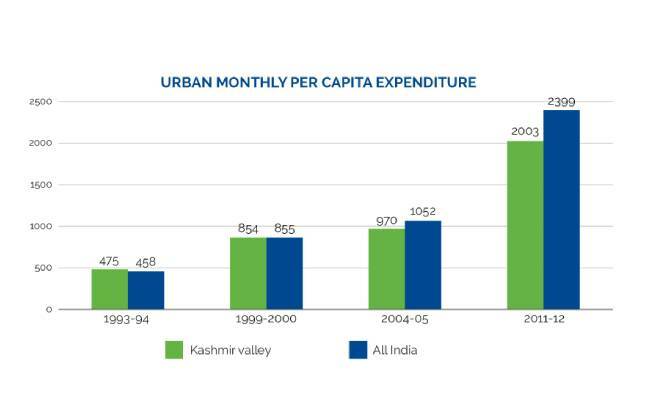 In comparison to the urban households in the valley, the data shows, the per capita monthly expenditure in rupee amount of the rural households is far less compared to both urban India and urban Kashmir. However, the patterns emerging from the data show that despite the three decades of conflict, the rural Kashmir is faring much better than the rural areas of the rest of India. 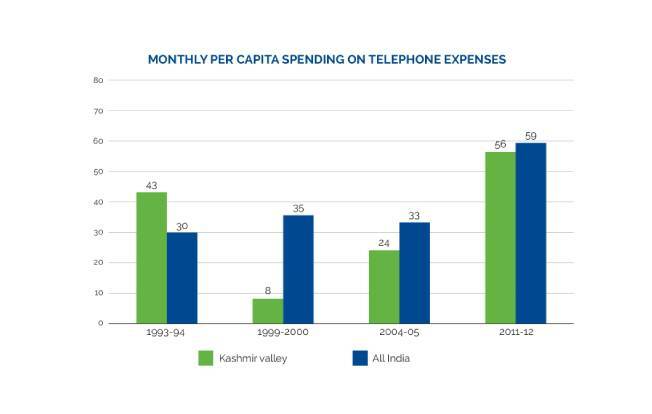 This chart shows how the expenditure on telephone services (fixed line) came down in the peak years of conflict in Kashmir. 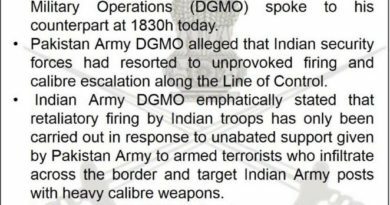 After the breakout of the armed insurgency in the valley, the availability of telephone connections was subject to security verifications and employed a cumbersome process, due to which the expenditure came down drastically. However, with the decline in militancy, the process of acquiring the telephone connections was eased out and thus the expenditure of an average household also increased gradually. 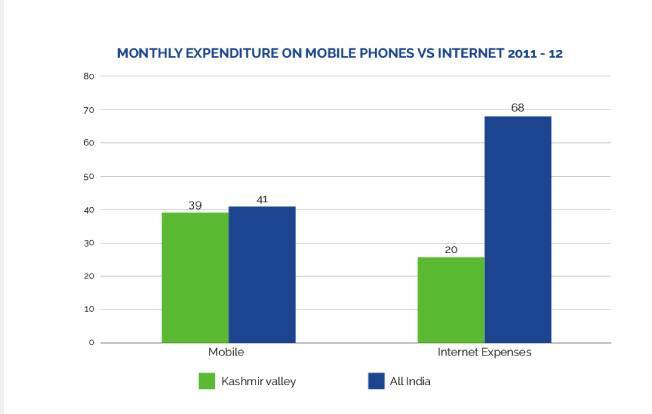 The data from the 2011-12 round of the survey shows that the expenditure on the mobile telephony in Kashmir valley was similar to that of an average household in the country. However, the Kashmir valley lagged far behind in the expenses on the fixed line internet connections. This chart depicts the steep increase in consumer expenditure on recreational goods comparing the 1993-94 round with the most recent 2011-12 round of the data. 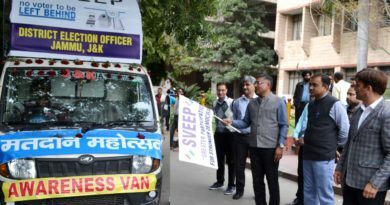 The recreational goods include radios, television sets, video players, camera and photographic equipment, musical instruments and other such goods for recreation. 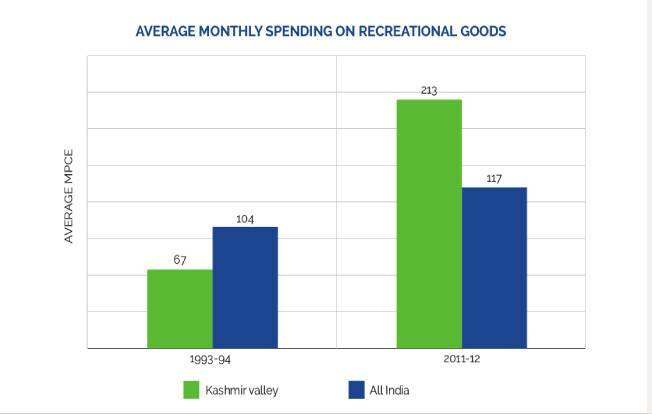 Compared to 1993-94, an average Kashmiri household is now spending more on recreational goods than an average all-India household. Interestingly, in 1993-94 an average household of the valley spent relatively much less amount on such goods – compared to all India average. 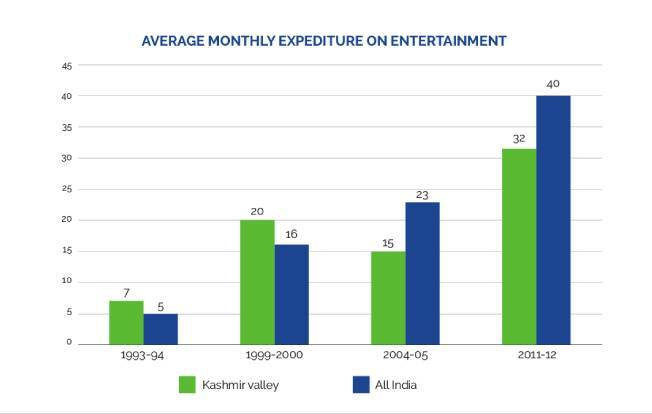 The above chart shows a comparison of the average monthly spending on entertainment registered by the households in Kashmir compared to the national average. The data under the entertainment category of the survey includes expenditure on outdoor entertainment including cinema, sports activities, club fees, sports goods, cable TV subscriptions and photography. The data shows a decline in spending on entertainment over the years. The chart shows the consumer spending on the entertainment services recorded in the urban areas. The survey rounds of 1993-94 and 1999-2000 show that there was not much difference in the spending patterns in Kashmir in comparison to the national average. 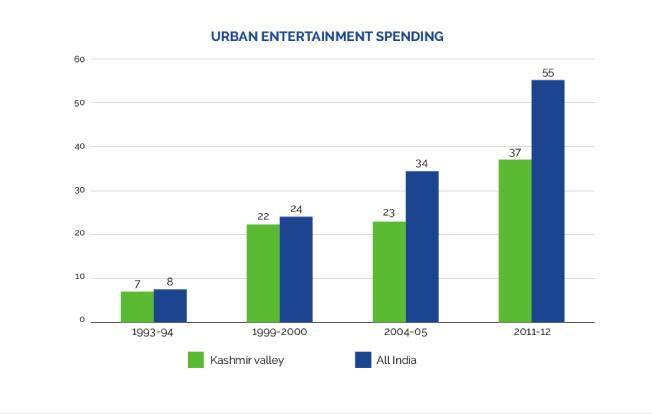 However, the 2011-12 show the urban areas of Kashmir valley are lagging behind and record a far less spending on entertainment than rest of the country. 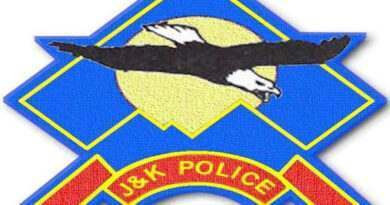 This is mainly due to the lack of entertainment avenues in the state of Jammu and Kashmir. The survey data shows that urban households are spending more on entertainment in comparison to the rural ones. While there has been a steady increase in the spending on entertainment in urban areas of the valley, the rural households have recorded lesser expenditure. 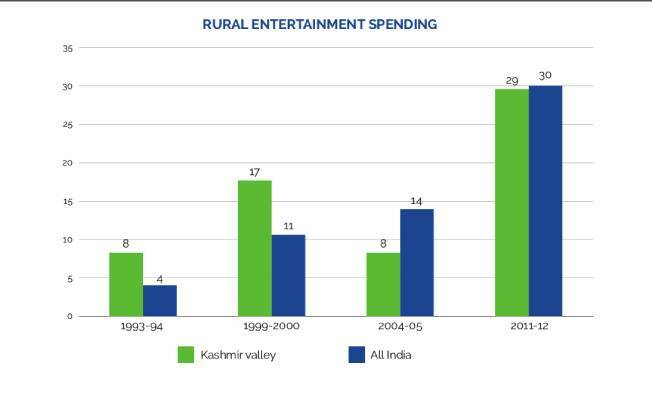 However, for rural Kashmir the gap with national average decreased in 2011-12 – showing patterns of spending on entertainment similar to national average.